WASHINGTON — SpaceX has delayed its two commercial crew test flights by four months, according to a new NASA schedule released Jan. 11, raising questions about whether it or Boeing will be able to send astronauts to the International Space Station by the end of the year as previously planned. The updated schedule, which NASA said represents “the most recent publicly releasable dates” for the two companies, lists an uncrewed test flight of SpaceX’s Crew Dragon spacecraft in August 2018, followed by a crewed test flight in December. The previous schedule released by NASA, in October 2017, stated those flights would take place in April and August 2018, respectively. SpaceX spokesperson Eva Behrend, in a statement to SpaceNews, did not discuss the reasons for the delay. “SpaceX continues to target 2018 for the first demonstration missions with and without crew under NASA’s Commercial Crew Program,” she said. In a Jan. 4 release, NASA outlined some of the milestones ahead for SpaceX before those test flights. 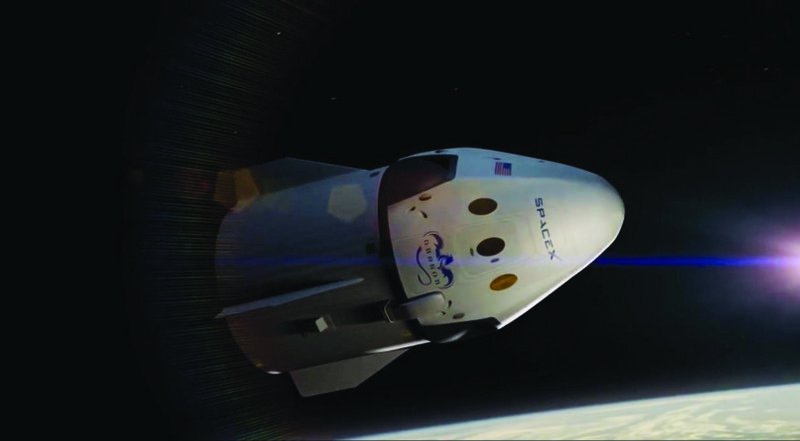 They include “continued, rigorous qualification testing” of both the Merlin engines used on the Falcon 9 as well as the Dragon’s SuperDraco thrusters, tests of the Dragon’s parachutes, post-splashdown recovery tests, and testing of the pressure suits that will be worn by astronauts flying on the Dragon. At the time of the release, NASA had not disclosed the latest delays, but the list of milestones suggested delays were likely. For example, NASA said that a second round of Dragon parachute system validation tests “will be completed by mid-2018,” which under the previous schedule would have been after the uncrewed test flight. The Boeing schedule released by NASA is unchanged from the previous version, with an uncrewed test flight of its CST-100 Starliner scheduled for August 2018 and a crewed test flight in November. However, in an interview in September 2017, Chris Ferguson, director of Starliner crew and mission systems at Boeing, suggested the crewed test flight could be delayed until early 2019. At that time, Ferguson said Boeing’s goal was to name the crew of that crewed test flight — one NASA astronaut and one Boeing test pilot — about 12 months before launch, but wanted to wait until the schedule was more certain before doing so. The company has yet to announce that crew. The Jan. 4 NASA release also listed a number of major upcoming milestones for Boeing’s vehicle, including spacecraft construction and testing, pressure suit tests, abort engine and thruster tests and continued parachute tests. NASA continues to rely on Russian Soyuz spacecraft to transport astronauts to and from the ISS, but had hoped to shift those duties to commercial vehicles by the end of this year. In October, NASA exercised an option in a contract with Boeing for three additional Soyuz seats on missions in the first half of 2019, which Boeing had obtained as part of a settlement with RSC Energia. The additional seats mean NASA does not have to rely on commercial crew vehicles for ISS crew transport until the second half of 2019. “We’re still thinking about ways to buy additional margin if we have to. There’s a whole spectrum of options that we are considering,” said Kirk Shireman, ISS program manager, at a Dec. 11 press conference at the Kennedy Space Center. He did not elaborate on those options. The status of the NASA commercial crew program will be the subject of a Jan. 17 hearing by the House Science Committee’s space subcommittee, which the committee announced Jan. 10. Boeing and SpaceX executives are scheduled to testify, along with officials from NASA, the Government Accountability Office and NASA’s Aerospace Safety Advisory Panel.